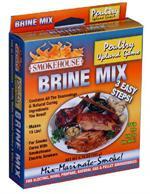 Smokehouse Products All Purpose Brine Mix is an all around brine mix for all types of meat: beef, waterfowl, upland game, and wild game. 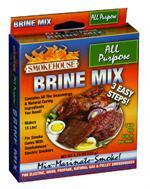 Just mix, marinade, and smoke for exceptional smoked meat every time. Smokehouse Dry Jerky Rub Black Pepper. Easily make homemade Black Pepper beef or wild game jerky! Each package of Smokehouse Black Pepper Jerky Seasoning makes 15 pounds of jerky. Smokehouse Products Jerky Brine Mix can be used with both strip meat or hamburger to make delicious homemade jerky from beef or wild game. 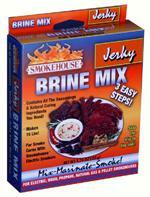 Make homemade jerky in just two easy steps with Smokehouse Products original jerky dry rub and seasoning mix. Mix with ground meat or strip meat to make jerky from home with ease. Make fresh homemade Polish sausage with this easy to use mix. Mix the polish sausage seasoning with 5 pounds of any type of ground meat: beef, venison, elk, bear, pork. 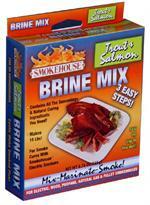 Smokehouse Products Brine Mix for Poultry, Upland Game, and other fowl. Quickly and easily seasons poultry for a perfect smoked bird! Add a spicy kick to your homemade jerky with Smokehouse Products Red Pepper Dry Rub and Jerky seasoning. This peppery meat seasoning seasons 15 pounds of strip meat or ground meat, from beef, elk, and more. 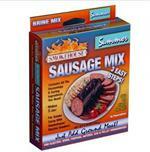 Smokehouse Products have been perfecting home smoked sausage recipes since 1968. This recipe booklet is the tried and true sausages recipes including wild game. 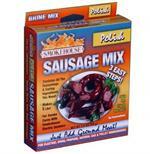 Make wonderful smoked Summer Sausage at home, with ease using the Smokehouse Summer Sausage seasoning mix. Just add 5 pounds of ground meat for homemade summer sausage. Smokehouse Products Teriyaki Jerky Dry Rub and Seasoning makes makes it easy to make homemade teriyaki jerky in just two steps. Make jerky from ground meat or strip meat. Looking for a homemade sausage seasoning mix with a kick? 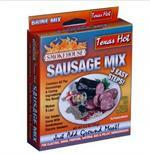 Try the Texas Hot sausage seasoning mix to create hot and spicy sausage using ground meat. Easy to use. Smokehouse Products Trout and Salmon brine mix can be used with any type of fish to produce mouth watering smoked fish every batch. 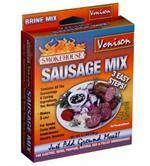 Make delicious homemade venison sausage with this easy to use Venison sausage seasoning mix.